Kate Skegg: Dare to Dream: Get Educated! My Guest Blogger this week, Kate Skegg, is doing great work with the Illinois American Association of University Women (AAUW). We both attend a “Meet Up” where we learn about WordPress, blogging and social media. At our January meeting she filled us in on her latest project, The Dare to Dream: Get Educated event for Latina girls and their moms. She barely finished telling us about it before I asked her to be a guest blogger. I wanted more folks to hear about this model the AAUW has created. (You can read more about why I love effective models in my Climbing to the Moutaintop, Part 3 post from yesterday.) I know you will enjoy hearing more about tomorrow’s event…. Atrévete a Soñar ¡Edúcate! — Dare to Dream: Get Educated! — will hold its fifth annual conference for young Latinas on January 26, 2013 at Elmhurst College in Illinois. Connie Baker, a former president of the AAUW Elmhurst (IL) Branch founded this conference for Latina girls and their mothers with the aim of encouraging girls’ academic achievement from middle school through college as well as success in a professional career. The conference targets DuPage County middle school girls in an effort to influence their decisions about college education and careers. In DuPage County, Hispanic girls drop out of school at a rate that is more than four times higher than non-Hispanic white peers, according to Illinois school report card statistics. To develop this program Latina educators, professional women and community activists were recruited, along with many talented members from local AAUW branches, including the AAUW Lombard (IL) Branch, the AAUW Wheaton-Glen Ellyn (IL) Branch, and the AAUW Downers Grove (IL) Branch. The mission of AAUW is to advance equity for women and girls through advocacy, education, and research. Dare to Dream: Get Educated! seeks to fulfill the AAUW mission by encouraging the education and self-development of the young Latinas who attend this conference, and to promote and enable a positive educational vision for each of them. This year, Eva Sanchez, the current president of Dare to Dream: Get Educated! will welcome the girls and challenge them to discover their BIG WHY: what it is that will inspire their dream for their future. Jennifer Cruz, principal of Royal Christian Academy, pastor, author and Mrs. Illinois 2012, will present the event’s keynote address. Jennifer will share from her own personal experiences of overcoming obstacles and hardship. Her positive, high-energy, and upbeat personality empowers Latinas to pursue their dreams and find ways to make them reality. Girls will meet other Latina role models including physicians, police officers and engineers and hear how they dealt with obstacles to achieve their dream of a better life. The Dare to Dream: Get Educated! Latina Conference is an opportunity to focus on the mothers’ own education as well as their roles in their daughters’ education. Students and their mothers will attend workshops on topics ranging from careers, campus life, and navigating the American school system, to mothers as mentors, and college preparation. The importance of careers in STEM (science, technology, engineering and math) is emphasized, and the girls will be invited back to attend an annual Dare to Dream STEM workshop day at Elmhurst College in November. The attendees from the first Dare to Dream: Get Educated! Latina Conference held in 2009 will be graduating high school and applying for college this year. These senior students are invited to apply for a scholarship to help them make their dream come true by offering tuition support to continue their education after high school. Sponsors are being sought to provide more scholarships. 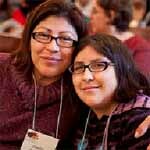 The 2013 conference on Jan 26th is at capacity, with 400 girls and mothers, and 100 volunteers participating. It will be a day of inspiration! For further information, call (630) 808-3533 or visit www.latinaconference.org. Guest blogger Kate Skegg is an eLearning professional. She is a member of Downers Grove Area AAUW and a board member and social media manager with Dare to Dream: Get Educated! My granddaughter, Wendy, was adopted by my daughter Susan when Wendy was seven years old. Wendy was born in Guatemala. Now she is a freshman at Willowbrook High School in Villa Park. When she was in middle school she was privileged to attend the conference for Latina Girls at Elmhurst College. Thank you for providing this opportunity. It is an excellent initiative.